Most fables have two levels of meaning. On the surface, the fable is about animals. But on a second level, the animals stand for types of people or ideas. The way the animals interact and the way the plot unfolds says something about the nature of people or the value of ideas. 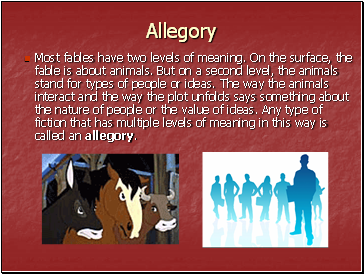 Any type of fiction that has multiple levels of meaning in this way is called an allegory. 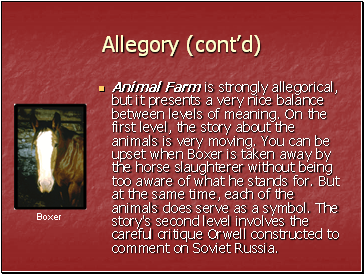 Animal Farm is strongly allegorical, but it presents a very nice balance between levels of meaning. On the first level, the story about the animals is very moving. You can be upset when Boxer is taken away by the horse slaughterer without being too aware of what he stands for. But at the same time, each of the animals does serve as a symbol. The story's second level involves the careful critique Orwell constructed to comment on Soviet Russia. Yet there is no reason that allegory must be limited to two levels. 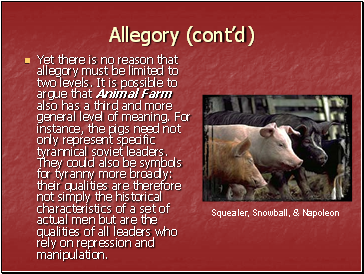 It is possible to argue that Animal Farm also has a third and more general level of meaning. For instance, the pigs need not only represent specific tyrannical soviet leaders. They could also be symbols for tyranny more broadly: their qualities are therefore not simply the historical characteristics of a set of actual men but are the qualities of all leaders who rely on repression and manipulation. In a satire, the writer attacks a serious issue by presenting it in a ridiculous light or otherwise poking fun at it. 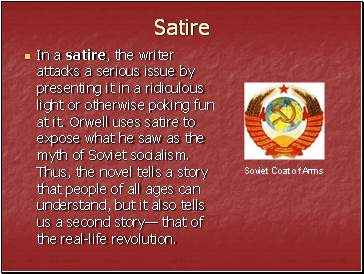 Orwell uses satire to expose what he saw as the myth of Soviet socialism. Thus, the novel tells a story that people of all ages can understand, but it also tells us a second story— that of the real-life revolution. 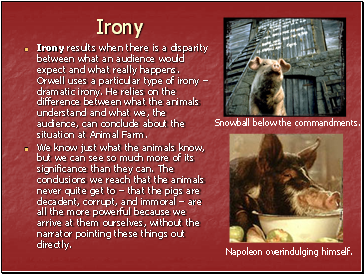 Irony results when there is a disparity between what an audience would expect and what really happens. Orwell uses a particular type of irony – dramatic irony. He relies on the difference between what the animals understand and what we, the audience, can conclude about the situation at Animal Farm. We know just what the animals know, but we can see so much more of its significance than they can. The conclusions we reach that the animals never quite get to – that the pigs are decadent, corrupt, and immoral – are all the more powerful because we arrive at them ourselves, without the narrator pointing these things out directly.